SEATTLE — Attorney General Bob Ferguson today announced a consumer protection lawsuit against the for-profit company that owns Value Village, alleging Bellevue-based TVI, Inc. has deceived thousands of Washington consumers and donors for more than a decade. The company is the largest for-profit thrift retailer in the world, generating more than $1 billion in annual revenue. It runs 330 stores worldwide and 20 Value Village stores in Washington state. The 37-page complaint, filed in King County Superior Court, contains numerous photos of actual advertisements used in Washington, and details the widespread deception created by Value Village’s aggressive marketing campaign. 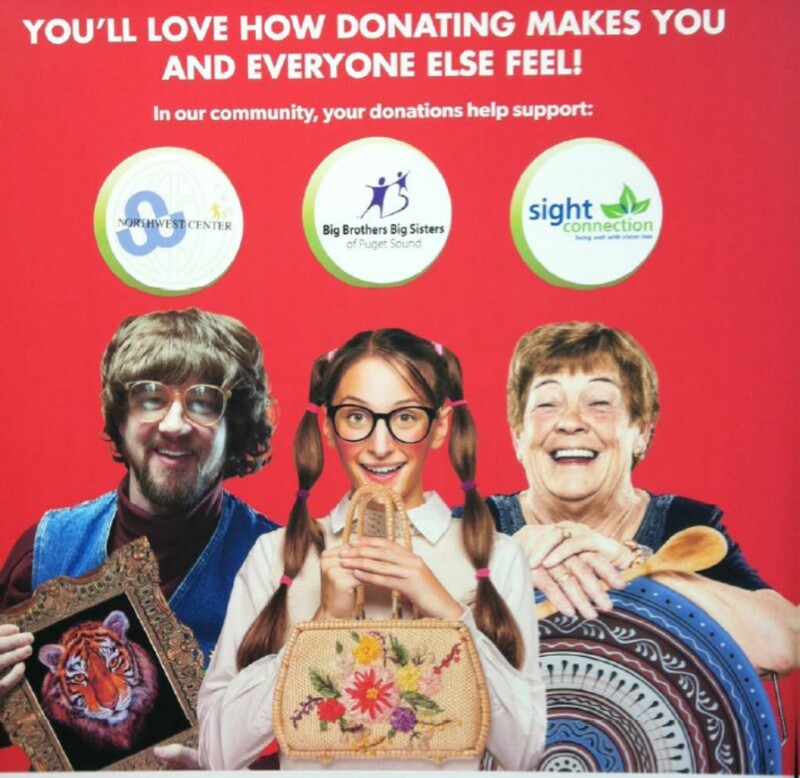 The numerous alleged deceptions mainly involve misleading consumers and donors to believe that all types of donations and purchases benefitted charity, and creating the impression that Value Village itself is a non-profit or charity. In fact, no portion of Value Village in-store sales benefits its charity partners, and contrary to Value Village's marketing, for years, some types of donations — including furniture and housewares — did not benefit charities at all. Others provided far less benefit than consumers were led to believe, or did not go to the charity indicated to donors. In many cases, the donations were in reality pooled and shared among multiple charities. The lawsuit alleges this conduct violates Washington’s Consumer Protection Act, which prohibits unfair or deceptive conduct in the marketplace and the Charitable Solicitations Act, which prohibits false, misleading, or deceptive charitable solicitations. Advertisement for Value Village. At the time this ad campaign was running, none of the items pictured would have benefitted charity partners at all. For more than a decade, Value Village only paid charities for cloth donations. For more than a decade, however, that was untrue. Ferguson’s lawsuit alleges this deception is a violation of the Consumer Protection Act and Charitable Solicitations Act. For example, until 2015, Value Village paid no money whatsoever to charities for donations of “hard items,” such as furniture, housewares and toys. In 2015, after the Attorney General’s Office initiated its investigation, Value Village began paying charities for these items — typically pennies per item. These amounts are drastically lower than the impression created by Value Village’s ads, which create the impression that charities receive a significant benefit from donations made at Value Village stores. The lawsuit alleges this is deceptive and violates the law. This was and is false. Value Village does not donate any portion of its sales to charity. The lawsuit alleges these claims are deceptive under the Consumer Protection Act and violate the Charitable Solicitations Act. During 2014, Value Village solicited donations purportedly benefitting the Rypien Foundation at Spokane stores. The company paid Rypien a flat fee per month for the use of the foundation’s name and logo, giving customers the impression that customer donations would benefit Rypien. However, no donations went to Rypien. The Spokane stores falsely advertised that every time consumers made donations, Rypien would benefit. In 2005, Value Village contracted with the Moyer Foundation, a charity founded by former Seattle Mariners pitcher Jamie Moyer. Moyer agreed to appear in Value Village’s advertising efforts. In exchange for these appearances, Value Village agreed to pay the Moyer Foundation 4.3 cents per pound for clothing donated to three Washington stores. The agreement expired in 2006. Yet, until 2015, the three stores bore the Moyer Foundation logo without the foundation's knowledge. Value Village continued to claim that donations benefitted the Moyer Foundation without providing any payment to the charity. This deceived consumers in violation of the Consumer Protection Act and the Charitable Solicitations Act, the lawsuit alleges. The company stopped this conduct in 2015, only after the Moyer Foundation discovered it. An independent study commissioned as part of the investigation shows that Value Village’s conduct deceived Washingtonians. More than 75 percent of Washingtonians surveyed in a test group believed that the company was a charity or nonprofit organization. When asked to evaluate actual products sold in Value Village and estimate how much of an item’s price was provided to a charity, more than 90 percent of the test group overestimated the amount of money the charity would receive. The majority of respondents believed that a charity would receive one third or more of the item’s sales price from Value Village, when in fact no portion of the sale goes to charity. Depending on the type and amount of donation, charities may receive only pennies, or prior to 2015, nothing at all from donations. Consumers have shared their frustration over Value Village’s practices in complaints to the Attorney General’s Office. Ferguson’s lawsuit seeks a court order prohibiting Value Village from making misrepresentations to customers and donors including: which charities benefit from donations, the amount of donations benefiting charities and that in-store sales benefit charity. TVI has 20 days to respond to the complaint. Assistant Attorney General John Nelson is handling the case for Washington. Last week, attorneys for Value Village filed a preemptive lawsuit against the Attorney General’s Office in an attempt to avoid responsibility for their deceptive acts. Value Village’s lawsuit omits many important details of the Attorney General’s investigation and includes several inaccuracies. Ferguson filed a motion to dismiss Value Village’s lawsuit today.